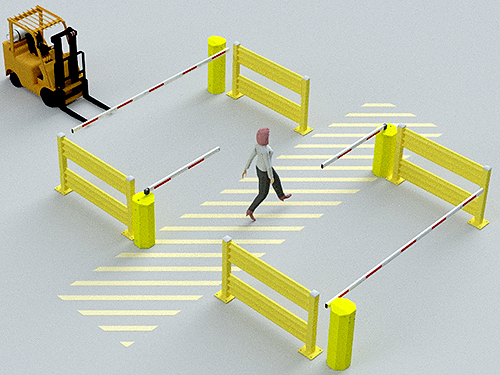 The AisleCop® Dual Pedestrian / Dual Vehicle Gate System helps control vehicular and pedestrian traffic where pedestrian and industrial vehicle traffic patterns cross. Triggered by motion detectors, two pedestrian gates and two vehicle boom arms open and close based on preferences you specify, whether you want vehicles or pedestrians to have priority for a particular crossing. 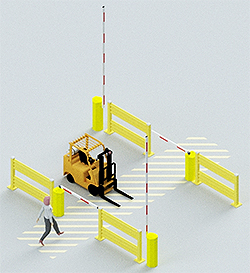 In either case, pedestrian gates close when a forklift is detected and boom arms lower to warn vehicles of pedestrians crossing the intersection. To further enhance pedestrian safety, flashing lights and an audible alarm are triggered when the system is activated. Custom control and sensor configurations are available upon request. Guardrail sold separately. Pedestrian Gate Width (Closed): 54-3/8"
Pedestrian Gate Swing Radius: 47-3/8"
Pedestrian Gate Depth (Open): 57-5/18"
Vehicle Gate Cabinet WxD: 11-3/4"
Vehicle Gate Cabinet Height: 40-7/8"
System Components: 2 motorized, fully enclosed push button pedestrian gates with red flashing LED lights; 2 crossing arm gates with arms and foam bottom padding (specify length up to 12 ft.), 1 auto reverse feature (automatically reverses if gate contacts object/person), 2 forklift motion sensors, 1 pedestrian sensor, 1 control wiring enclosure with key lock panel, and PLC-based control package.